Looking for college-level professional development or personal enrichment courses? 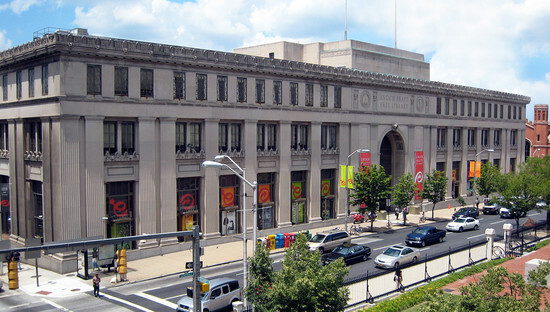 The Pratt Library now offers hundreds of FREE online courses accessible anywhere, anytime, anyplace. Gale Courses provides well-crafted lessons, expert online instruction, and interaction with fellow students. The Virginia Center for the Creative Arts (VCCA) is pleased to announce an important fellowship opportunity. 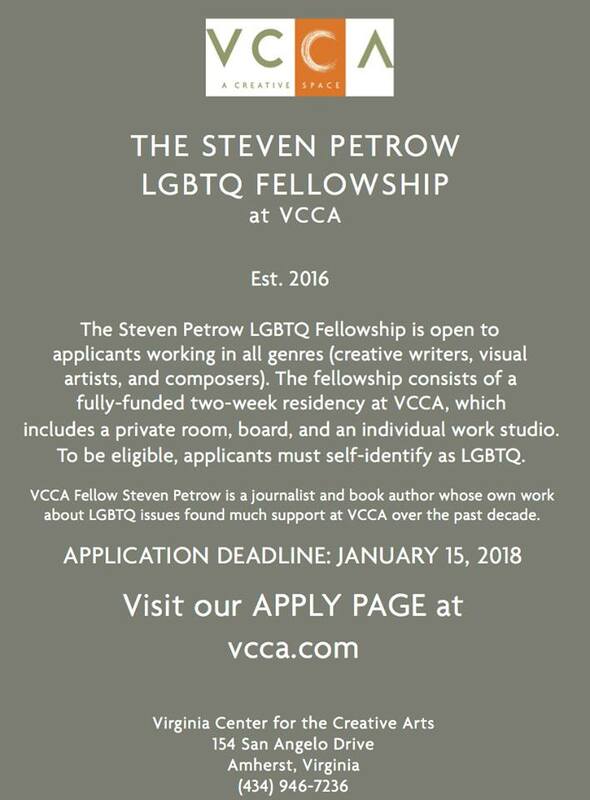 The Steven Petrow LGBTQ Fellowship (est. 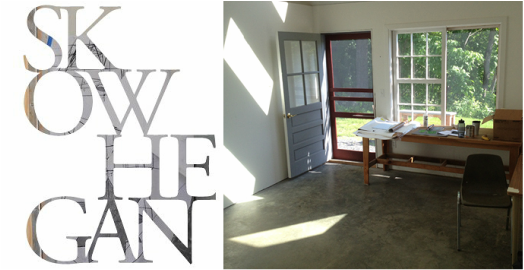 2016) is open to applicants working in all genres (writers, visual artists, and composers) and consists of a fully-funded two-week residency at VCCA during the Summer 2018 scheduling period (June through September). This fellowship includes a private room, all meals, and an individual work studio. Eligible applicants must self-identify as LGBTQ. The VisArts Emerging Curator Program offers a unique opportunity for an emerging curator to work with an experienced mentoring curator to develop and present an exhibition and to assist in the presentation of the mentor’s exhibition. In an effort to develop expanded education programming/enhanced visitor experiences, the 2018 Emerging Curator and the Mentoring Curator will also focus on developing tools, templates, technological enhancements and funding strategies to support public programming that promotes social interaction, creative exchange and audience engagement. VisArts will provide the Emerging Curator with an exhibition budget of $10,000. Additional funding and staff support for printing, promotions, and execution of exhibition programming is available. The program is one year and will begin in January 2018. The City of Shoreline seeks an artist or artist-team to design, fabricate, and install a dynamic, site-specific artwork with the primary goal of serving as a landmark for the center of this young and growing city directly to the north of Seattle. Placement will occur on an approximately 1-acre triangular-shaped project area located along the city’s main arterial, Aurora Avenue (aka SR 99), between North 175th Street and North 178th Street, and Aurora Ave North and Midvale Ave North. Currently, the site is flat, with a few small trees and a preserved section of historic brick road, a relic of the Interurban trolley line (1902 – 1940; see map). The site is frequently used by trail riders, dog-walkers, families, and numerous others, with many thousands driving by in cars at maximum speeds of 40 mph. As a work of public art located along a transportation corridor, it should not create a distraction for drivers. Artworks that include solar panels, sound, kinetic, or interactive elements, projections, water features, time-based components, landscaping / earthworks, or light elements are especially welcome as a reflection of the city’s environmental ethic. Download the full RFQ for more information including the Artists Selection Process, Selection Criteria, and Timeline. The fee is $65 if you apply between December 7, 2017 and January 7, 2018. The application fee is $80 if you apply between January 8 and January 10, 2018. Young Audiences is offering paid positions for artists to train as Teaching Artists and use their art in the classroom setting at the Summer Arts & Learning Academy, July 9-August 10. (Training will be between January and April, 2018). At the Academy, artists will team with academic teachers to work in the mornings with Baltimore City children on art and arts-integrated literacy and math, and then will lead art experiences in the afternoon.